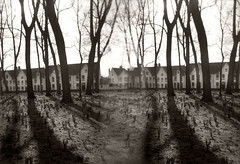 Bruges Trees, a multiple exposure image taken with a Holga Camera will be part of this exhibit. The juried competition was open to international artists working with plastic cameras with plastic lenses. The more obsolete, flawed, and lo-tech, the better. Images were taken with cameras with limited controls, such as Diana, Holga, Lubitel, Lomo, Banner, and Ansco cameras. Beautiful prints from less-than- gorgeous cameras – that’s what will be on display! This is RayKo’s largest exhibition of the year with artists from all over the globe submitting work, and hundreds of attendees at the reception.